One of North America’s largest railroad companies has asked a federal judge to detour the Illinois Tollway’s plans to take land at a Bensenville rail yard as part of the highway agency’s plans to extend and improve the Elgin-O’Hare Expressway. On Nov. 13, Canadian Pacific Railroad filed suit in federal court in Chicago asking a judge to declare the Illinois Tollway lacks the authority to take its land for the new roadway, as federal interstate commerce laws effectively nix the state agency’s eminent domain powers over land owned and used by railroads for shipping freight. The lawsuit stems from the Tollway’s announced plans for its so-called Elgin O’Hare Western Access Project. According to the Tollway, the project would cover 17 miles of roadway, including 15 new or improved interchanges along Illinois Route 390, which the Tollway says is now “formerly known as the Elgin O’Hare Expressway.” The project also entails extending the project along Thorndale Avenue to O’Hare and building a new roadway around the airport’s western edge to connect Interstates 90 and 294. The project has been designed a “Project of National and Regional Significance” by federal transportation legislation, the Tollway said. Canadian Pacific’s beef has arisen out of the Tollway’s plans for the north-south connector route between the Jane Addams Memorial Tollway (I-90) and the Tri-State Tollway (I-294.) Under the plans posted on the Tollway’s website, the portion of the proposed new roadway running south from Irving Park Road to the Tri-State would include a new interchange at the new highway’s junction with Franklin Avenue/Green Street in Bensenville. And that route would not only take the new highway right through Canadian Pacific’s Chicago rail hub, but plant the new interchange right at the southern end of the more than 300-acre rail yard, the railroad said. For this to happen, the Tollway has notified the railroad of its intent to use its eminent domain powers to take about 28 acres of land for permanent use for the new road, as well as about 8.5 acres for the use of the Tollway’s construction crews while the road is being built. According to the Tollway website, that portion of the new road is scheduled to be built over eight years beginning in 2016. 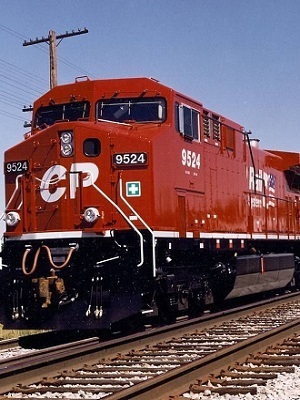 Canadian Pacific asked the court to stop the Tollway from condemning and taking the land, saying federal law gives the railroad the upper hand in such an action. The railroad notes the Bensenville rail yard is constantly busy, as it serves as Canadian Pacific’s only Chicago-area terminal and switching yard. More than 2,200 rail cars pass through the yard daily, the complaint stated, or more than 800,000 each year. And the yard also boasts an intermodal terminal, at which about 600 shipping containers per day, and more than 200,000 annually, are loaded and unloaded from trucks to trains and back. Additionally, Canadian Pacific said 58 commuter trains move through the yard each day on Metra’s Milwaukee District West line. Given the amount of rail traffic moving through the yard, the railroad argued in its complaint the Tollway’s proposed taking of its land would be a “impermissible burden” on interstate commerce, and so should be prohibited under federal law, which, it said, should take precedence in this case. “The taking seeks to convert CP’s privately-held railroad operating property into a public highway, removing that acreage from CP’s ability to use the land for railroad transportation purposes,” the complaint said. And Canadian Pacific said the Tollway’s decision to pursue the railroad’s land is simply an attempt to avoid a potential political mess elsewhere. “Upon information and belief, the Tollway seeks to condemn CP’s property for monetary and political reasons, believing it to be cheaper and less objectionable than seeking to take the adjacent parcels of property which lie across Franklin Avenue/Green Street from Bensenville Yard that would provide a nearly identical design route for the new toll road,” the complaint said. Canadian Pacific is represented in the action by the railroad’s staff attorneys, based in Chicago and Franklin Park. Want to get notified whenever we write about Canadian Pacific Railway ? Sign-up Next time we write about Canadian Pacific Railway, we'll email you a link to the story. You may edit your settings or unsubscribe at any time.